Labeled an eco-terrorist, racist, and sexist, Edward Abbey managed with his writings to offend as many as he inspired. Known for his radical environmentalism, Abbey also belonged to the NRA, believed the Mexican border should be sealed, and took pot shots at MS. Magazine. Beneath these liberal and conservative contradictions, Abbey possessed a deep intelligence in his role as writer and genuine warmth in his roles as husband, father, and friend. Each of these roles is pushed to the forefront in this collection of Abbey’s letters. While the title refers to his habit of sending postcards to friends, most of these missives exceed postcard length. The editor, who has written nine books and edited four more, including Confessions of a Barbarian: Selections from the Journals of Edward Abbey, offers a generous sampling of Abbey’s correspondence with friends, authors, his children, book publishers, newspaper and magazine editors, and his agent. Since very little of Abbey’s early correspondence has survived, the bulk of this collection spans between 1970 and 1989, the year of his death. By turns feisty, supportive, and satirical, Abbey is, more than anything, forthright, plainly stating what is on his mind and apologizing when, as often happened, his forthright manner offended someone. While Abbey is remembered as a concerned environmentalist, his letters continually remind others that his life’s interests extended beyond one sphere. His work as an author, in both fiction and nonfiction, occupied a great deal of his time. In the mid-1970s, he finished what would become his best-known novel, The Monkey Wrench Gang. The letters from this period offer insight into both Abbey’s method of writing and the minutiae of working out details—book jackets, advertisements, and reviews—with publishers and managers. The letters reveal a softer, more emotionally warm Abbey than his contentious reputation would lead one to expect. For example, in a letter from 1975, he apologizes to his father for hurting his feelings in an earlier letter. Abbey generously praises fellow novelists William Eastlake and Thomas McGuane, and offers supportive advice to his children, though letters addressed to his children are rare in this collection. Readers will appreciate Abbey’s humor, as when he writes to newly elected president Jimmy Carter suggesting that he appoint Joan Baez as Secretary of State. 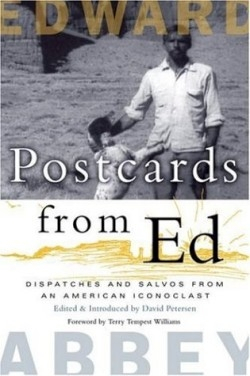 Ultimately, Postcards From Ed works like a good autobiography, giving readers a sense of Abbey beyond his reputation as the father of the radical environmental movement. In fact, reading these straightforward, warm, and intelligent letters will probably remind readers of correspondence that they have received from a good friend with strong opinions. Readers unfamiliar with Abbey’s work will probably want to start with Desert Solitaire or The Monkey Wrench Gang. Postcards From Ed, however, will be a good place to broaden the understanding of a contentious, complex, and likable human being.